Bob Wittbrot of Bob Wittbrot & Associates Insurance Services tries out the HoloLens Technology with Dr. Shivakumar Sastry. 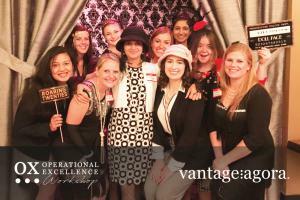 The ladies of Vantage Agora gather for a photo opportunity at the 1920's inspired cocktail reception held at the Vault under the Metropolitan at the 9. 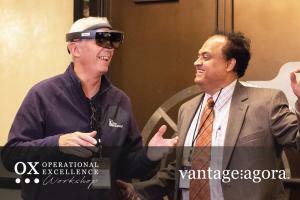 Vantage Agora’s 2018 OX Workshop brought together a variety of industry experts for the opportunity to learn and network at Cleveland's Metropolitan at the 9. CLEVELAND, OHIO, UNITED STATES, October 24, 2018 /EINPresswire.com/ -- Another successful workshop was placed in the books last week for the team at Vantage Agora. 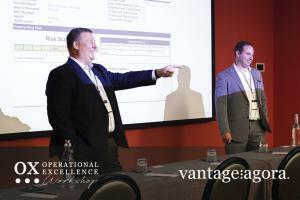 On October 17 and 18, Vantage Agora hosted their 3rd Annual Operational Excellence (OX) Workshop at the Metropolitan at the 9 in Downtown Cleveland, and guests had rave reviews. Speakers at the event ranged from Dan Issel, former coach of the Denver Nuggets and member of the NBA Hall of fame, to the CEO of Signature Health, Joseph Steier, who joined the conference remotely for his keynote presentation. The event offered 2 tracks to choose from - one focusing on technology and the other focusing on engaging and energizing staff. The two tracks allowed for cross-sectored advice to be heard, and each speaker honed in on something similar; offering solutions to some of the most commonly-faced challenges in the workplace. The 2018 OX Workshop speakers did a remarkable job of creatively and enthusiastically sharing their expertise. Whether it was the University of Akron’s Dr. Shivakumar Sastry discussing how Augmented Reality (AR) helps astronauts in space and surgeons alike, or Kim Riley of Hylant discussing the best way to stand out while 'Networking Beyond Your Bubble', each presented commonly-faced challenges of today, and shared unique and thought-provoking ways they have learned to overcome them. In addition to the scheduled presentations, demos of OX Zion (VA's Industry-Leading Business Operating System) were given throughout the day for attendees interested in how Vantage Agora provides unique solutions to companies in a variety of industries. Guests also had the opportunity to network in a lively atmosphere Wednesday night at a Roaring 20's themed cocktail event, and another opportunity to relax and let their guard down for a night of entertainment and crowd participation during dinner at Pickwick and Frolic. One of this year’s attendees, Tanya Sabat stated, “I am so very happy that I chose to take advantage of your event that led me to meet so many fabulous people, and to learn so much more than I had anticipated. From the panel of speakers, to the choice of venue, the meals, and down to the dinner and entertainment!" Individual presentations and shared recordings will be available soon on Vantage Agora’s social media pages and the event website: vantageagora.com/oxworkshop. Plans are already in motion for next year, which is sure to be just as informative and spirited!